How is an infrared sauna different to other saunas? Unlike other heating methods that warm the air in the room (using hot rocks or steam), infrared actually heats you from the inside – just like the sun, but without the damaging UV rays. Traditional saunas heat the air inside the room/cabin to a very high temperature to warm the body, and some people have difficulty breathing in such warm temperatures. Using full spectrum (near, mid and far) rays, our infrared sauna heats you from the inside, allowing joints and muscular tissue to absorb the heat, resulting in a deeper, more beneficial detox. What does full spectrum mean? Near infrared (NIR) penetrates the skin’s surface more effectively than the other two, promoting skin renewal, cell health, wound healing, and tissue growth. Mid infrared (MIR) can penetrate deeper into the body’s soft tissue where inflammation occurs. MIR helps expand blood vessels and increases circulation, so more oxygen can reach injured areas of the body. Far infrared (FIR) reaches deepest into the body, where toxins are stored. By raising your core body temperature, FIR stimulates the sweat glands, resulting in a deep, detoxifying sweat that leaves you feeling revitalized. Plus, since sweating increases heart rate, cardiac output, and metabolic rate, you’re also burning calories. Begins with high intensity to increase the body’s core temperature and then reduces to a low intensity level. The Mid and Far Infrared combo improves vascular access to reach toxins at the cellular level. Induces deep relaxation, relaxing muscle tension at low intensity promoting overall stress release and relaxation. Far and mid infrared provides natural pain relief by reducing inflammation and swelling. The near infrared penetrates surface tissue to promote cellular repair. Begins at a high intensity and then lowers to sustain heart rate. With near infrared coming on and turning off at different periods through the program. Begins with a low constant intensity level of far and near infrared wavelengths, which penetrate tissue improving overall skin tone, elasticity and firmness. Starts at a high intensity to stimulate the cardiovascular system, then reduces to a medium level. As the body works to cool itself, there is an increase in heart rate and cardio output and metabolic rate similar to exercise. The first thing people notice is a stress-relieving relaxation of the muscles. Tension melts away and the deep penetrating warmth is very soothing on aches and pains. With regular use you feel the benefits of a deep, healthy sweat that purifies your body and improves circulation. After the first session, people often notice clearer skin and a deep, restful sleep. We have a sound system in the sauna that can be accessed by bluetooth. We also have Spotify to play music through and Netflix to watch, if you’d like to stay occupied whilst you enjoy the sauna! Far from a new technology, infrared heat has been used in a variety of health and human movement applications for many years. 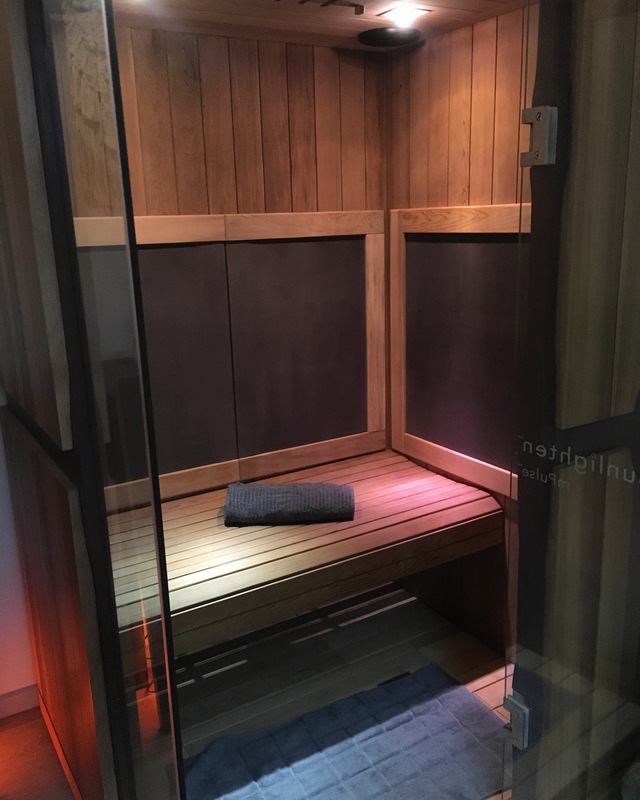 Sunlighten saunas use a refined heating technology called Solocarbon, which is used in day spas, gyms, training studios and health practices worldwide. Unlike tanning beds, Sunlighten saunas use infrared heating, which is entirely different to microwaves, or ultraviolet radiation. No. Fresh towels and wraps are provided or you can bring your own. DO YOU HAVE A SHOWER? Yes, we have a shower for your use after the sauna. It is important to wipe off sweat and shower as soon as possible after infrared sauna use. This is to avoid re-absorbing the toxins you have just sweated out! We have natural Sukin body wash, shampoo and conditioner for your use. Some like to wear their bathing suits or undergarments when in the sauna, however most go in with just the towels we provide. We recommend bringing loose, comfortable clothing to change into after your session. Please refrain from applying any oils or lotions to your skin prior to entering the sauna. Yes, bring a friend for an additional $15. NEED TO CANCEL A SESSION? Please cancel through the MINDBODY app or website, as you booked. Alternatively, you can call us on 9002 1158 between business hours and we will credit your account for use next time. If you do not show up, you will forfeit the session. We do not recommend the sauna for pregnant women. For a full list of contraindications, see here. No unsupervised children under the age of 16. We require you to read through contraindications of infrared sauna use and to fill out a waiver before your first session.